Never in my working life of 14 years did I imagine that I would be barging into so many rural households to inspect toilets in the span of 2 months. The credit for this goes primarily to Arghyam! 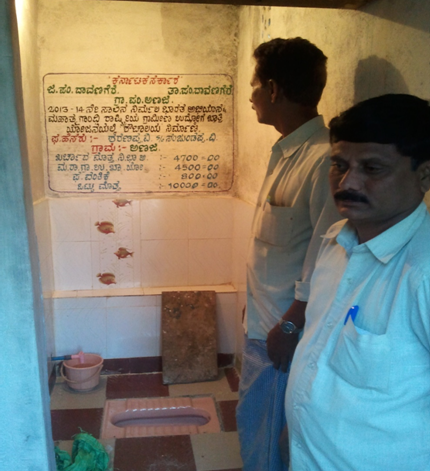 As a first step towards the quantitative assessment of the demand generation campaign in Davangere district, Karnataka, Ravishankar Rao, Sita Sekhar and I carried out a scoping exercise from 21st to 23rd August 2013. 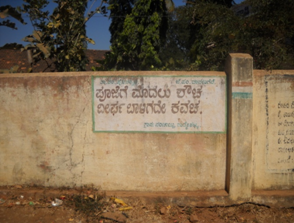 This involved visiting Davangere district, collecting background data from the Zilla Panchayat office, gaining an understanding of how the Nirmal Bharat Abhiyan (NBA) works on the ground through discussions with officials at all levels as well as through Focused Group Discussions (FGDs) with villagers. The visit to Anaji and Anaburu villages in Davangere Taluka, where the scoping was done, began with an FGD with Gram Panchayat (GP) officials. 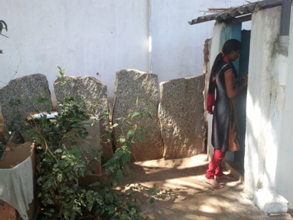 We then started out on a transect walk to observe the status of toilets in the village as well as to conduct FGDs with men and women separately. While Sita did the FGDs with women, Ravi and I spoke to the men. It was found that while men were generally unwilling to build toilets, they sometimes didn’t even feel the need for them; women on the other hand, were unanimous in extolling the virtues of having a toilet in their homes! Private parking for a cycle! In consultation with Arghyam, the sampling was done in such a way that all six talukas were covered and the sample was reflective of the population of Davangere based on many indicators. Proportionate samples were selected from each taluka to make the sample representative – 800 households from 25 GPs selected in the intervention area and 500 from the 20 GPs selected in the non intervention area. After the scoping and discussions with Arghyam on their requirements, the questionnaire for the baseline survey was designed. This questionnaire was piloted in Kaidale (Kaidale GP) and Kyatanahalli (Huchavvanahalli GP) villages in Davangere Taluka by Sita and me on 9th and 10th of December 2013. The purpose of the pilot was to check for comprehensiveness, length, and flow of the questionnaire. A team of 23 able enumerators and 4 supervisors (most of them from Davangere) were trained at the ZP office in Davangere over two days in the month of December by Sita, Tibin Jose and I. The first day was largely spent going over each question carefully till everyone understood it. Some time was spent in carrying out mock interviews. The mock interviews took the enumerators down memory lane about their own villages and how there were hardly any toilets there! 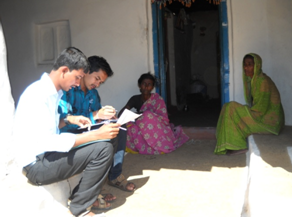 Half a day was spent in Honnuru in Davangere taluka, where each team member was asked to carry out an interview. 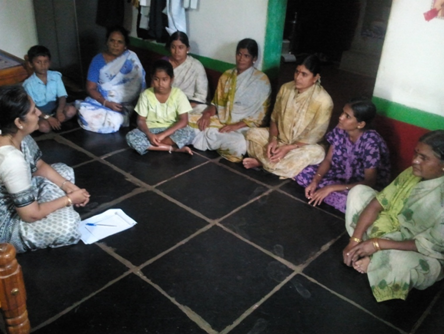 Most of the enumerators built a rapport with the respondents by speaking in their own dialect of Kannada. The team was put through a debriefing session in the latter half of the day for them to seek any clarifications they needed and for us to understand how they carried out the task. 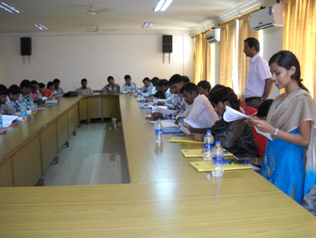 Another session of mock interviews was held as well. On 18th December the smaller teams set off to the different Talukas to start the baseline survey. The survey was carried out between 19th and 31st of December 2013. Lalita, Tibin and I monitored the interviews for quality assurance twice during the survey period. PAF’s youngest team member Tibin came across some interesting situations. “In one of the villages, as we went along with the enumerators, we met a lady near a house and asked her if the house had a toilet. She said it did. At our request she proceeded to give us a tour of the toilet and gave us all details of the family as well. While the enumerator was furiously noting down all details in the questionnaire, and asked her how far she has to go to fetch water for the household, it turned out that she was only a neighbor of that household and not a resident of that house! 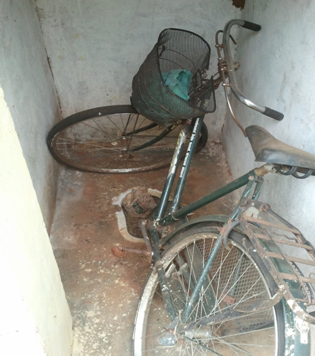 In yet another village we found a strange sight: a toilet with no walls and the seat covered with stones! 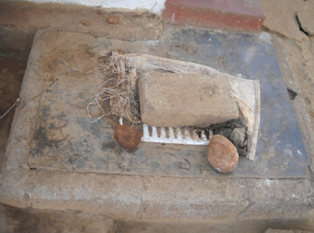 Unable to contain our curiosity, we asked people about it and they said it used to be a functional toilet and was used as well for a while, but suddenly the household realized that the toilet faced the temple nearby, decided it was ‘unholy’ to use it, and demolished it promptly! After the survey was completed, every questionnaire was scrutinised by the supervisors and then run through a quality check by the PAF team. The quality cleared questionnaires were then given for data entry. The entered data was checked, cleaned, and then analysed at PAF. The baseline report is now being prepared and we will be sharing the findings with everyone soon. Has PAC or PAF or Rohini NIlekhani considered having a very well kept and clean toilet for women with about at least six cabins with a self contained overhead tank for flushing and a septic tank from which methane could be piped out as kitchen fuel.